Has your child ever been bullied? Have they ever stood up and protected someone who was being bullied? I was bullied most of my life either at home or school. The cycle didn't break until I went away to college. I made it my goal to raise my own children to have confidence to be the person who protected those being bullied. I chose the high road in the sense that I wanted my girls to be giants. Giants do not have to be the biggest or the best but someone who has the confidence to stand up for others in need. How to raise a giant? As a parent I do understand that some people do not know where to turn to teach the kids to be giants. It also takes a lot more to raise a healthy child then just getting them to eat their vegetables. Thanks to Green Giant® who partnered with PACER’s National Bullying Prevention Center and We Day Minnesota to help parents Raise A Giant and put a stop to bullying in their community. 1- Write a letter to your kids telling them how special they are and encourage them to be part of the bullying prevention solution by being the giant. Let them know it is better to be on the helping side of those in need. 2- Visit the RaiseAGiant.com community to read letters others have written. They are amazing. 3-Spread the word to other parents and tips on how to do this are also at the online community. Let them know about the letter writing and then share the community with them. 4-Regularly talk to your kids about school and their online use to make sure that they aren't getting bullied. Teach them how to recognize the signs of bullying and speak to an adult in charge if they know someone is getting bullied. 5-Give love and support to your kids and teach them to be proud of who they are, no matter what others may say or do. 6-Share your own personal stories of getting bullied or when you help someone who was being bullied. Do you have any tips to share? Leave them in the comments below! I would tell my kids to turn to an adult if they're being bullied. I would teach them to never ignore if being bullied, must always tell adults. to bullying in their community. Tell children to not be afraid of bullying and to tell parents or any adult if the are being bullied. I learned: Being a "Giant" is about finding your inner courage to rise above the crowd and do what is right, which is very difficult, these days. I will tell my daughter that if she is ever bullied or sees someone being bullied, to tell me or any other adult. I learned that studies show that an effective way to stop bullying is for kids to simply speak up and say, "That's not okay." The way this giveaway is worded, it looks like we can make more comments for more tips and things we learned? If so, here goes a few more. If not, feel free to delete them. Thanks. I would tell my kids not to fight. Fighting back can make bullying worse. I would tell my kids that if you witness bullying, to stand next to or speak up for the person being bullied and tell the bully to stop. Sometimes just being stood up to can cause a bully to stop. I would tell my kids to always think about what they say to people and how it would make them feel. Sometimes you think you are being funny or joking, but it is actually hurting another person and YOU have suddenly become the bully. I would tell my kids to avoid the any bully as much as possible. If you see the bully, walk away. And if you are in danger, RUN. I would also let my kids know that sometimes, a bully acts that way because he/she is being bullied at home, or has such low self esteem that he/she bullies others to feel in power and in control. Many times they have bad home lives. 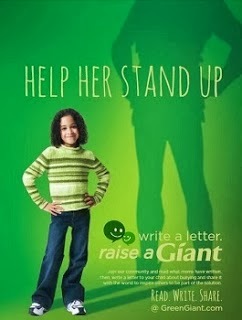 From Raiseagiant.com I learned that one of the biggest threats to kids happiness and HEALTH is bullying. I wrote a letter (called to my daughter)! I learned that being a "Giant" is not about being the biggest or best. It is about finding strength and courage to stand up and do what is right. I would tell my kids to stand up for themselves and give them confidence! You've got to learn to laugh at people when they are trying to bully you. I think nothing is more infuriating! 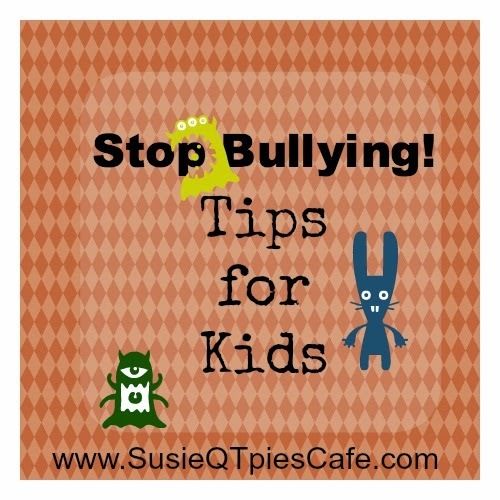 My tip is to tell kids to stick up for each other.